Sometimes I stop at the front of the grocery store and rummage through that end-of-season, after-holiday stuff: the green and red candied cherries, and the like. I seldom find anything that I want to bring home with me so I’m not always consistent about checking it out. I have to thank an observant friend and neighbor for a “find” in that cart recently: truffle oil (from Tuber melanosporum, the Perigord black truffle)! She thought I might like to know about it–and a phone call sent me scurrying off to the grocery store to check it out. I was pleasantly surprised to find two 8.54-ounce cans of La Tourangelle black truffle oil languishing amongst the mounds of candied cherries, candied pineapple, and other post-Christmas goodies. Even at the price marked before it ended up in the manager’s special cart, I would have tried it–but at half that, it was a true no-brainer–$4 and a little change. I came home with two cans–one to share with a fellow foodie so that we can be creative with it. So did I bring home treasure or not? 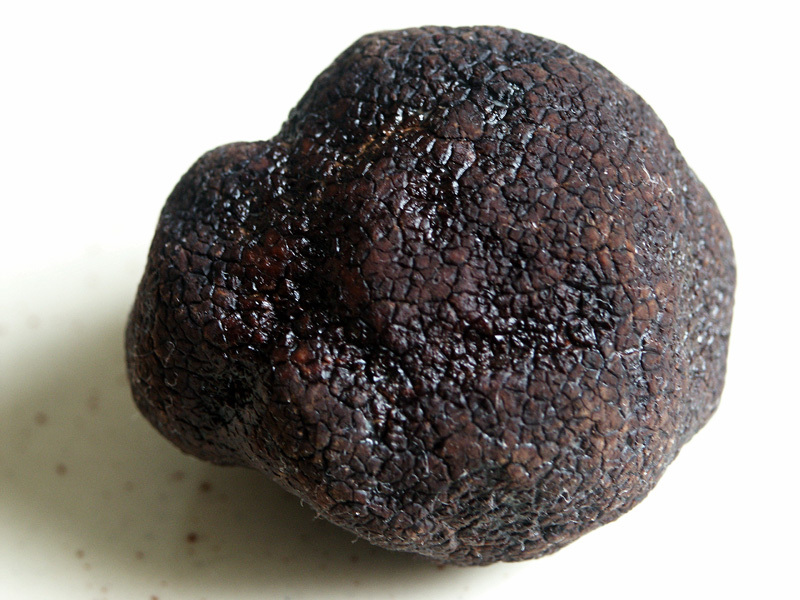 I’ve had the good fortune, in one of my previous careers, to have had experience with freshly harvested black truffles from Garland Truffles here in North Carolina, so I know that they should smell like. I was trying not to expect too much from my little bargain–a bit of the expect-the-worst pessimism, so that I might be pleasantly surprised. It’s hard to describe the aroma of fresh black truffles–but I’ve experienced it, so I was almost expecting to be disappointed when I opened that can of truffle oil. I guess it was a bit of you-get-what-you-pay-for, and I sure didn’t pay much for this. I was hoping for that rather ethereal, woodsy, moist, warm aroma, that makes you say “Wow, what is that?” It’s just unforgettable once you’ve experienced it. When I popped the seal and smelled that truffle oil, I was even more pleased with this find–the aroma was all it should have been–woodsy, earthy, moist (not damp, moldy, or musty though), and warm, in a way that set me right out in the woods in the sunshine. A little searching on the Internet I found the La TourangelI website--with an amazing array of artisan flavored oils. After checking prices on the web, I realized that I really had an amazing bargain. I’m not sure what the original price was in the grocery store, but I spent $4 and some change for the can, that had another price of a bit more than $8. The cheapest price I found online was at least double that latter price, and I’d say that’s not overpriced given the per-pound price of Tuber melanosporum! I love truffles, but they aren’t usually on my budget, so this is fantastic to have that much truffle oil–truly a rare treat. I’m still thinking of things to do with it–incredible fun for a foodie! What have I done so far? Well, one of my favorite combinations is truffles and potatoes. My favorite decadent treat? Take one properly baked russet potato (no foil anywhere near it and not microwaved either), and add some truffle butter. Okay, I didn’t have truffle butter, but this oil had a strong enough flavor that mixed with some softened butter, I came very close to the truffle butter than I had made when I had access to fresh truffles. Then, add some earthy, yeasty Champagne, and it is awesome. Then, I’ve drizzled a bit over a lovely steak–yum! And added a few drops to my omelette–and (as claimed by La Touranglle) the flavor stood up well to the heat necessary to cook the omelette, though I’d certainly not expose the truffle oil to high heat. What next? Well, I’m contemplating possibilities for combining this with another of my favorite foods, oysters. I’ve looked at recipes for truffled oyster stew, and found some possibilities…but who knows what will be next…maybe a bit added to a grilled cheese sandwich (preferable made with raclette). It’s time for improvisation in the kitchen. A son goût!